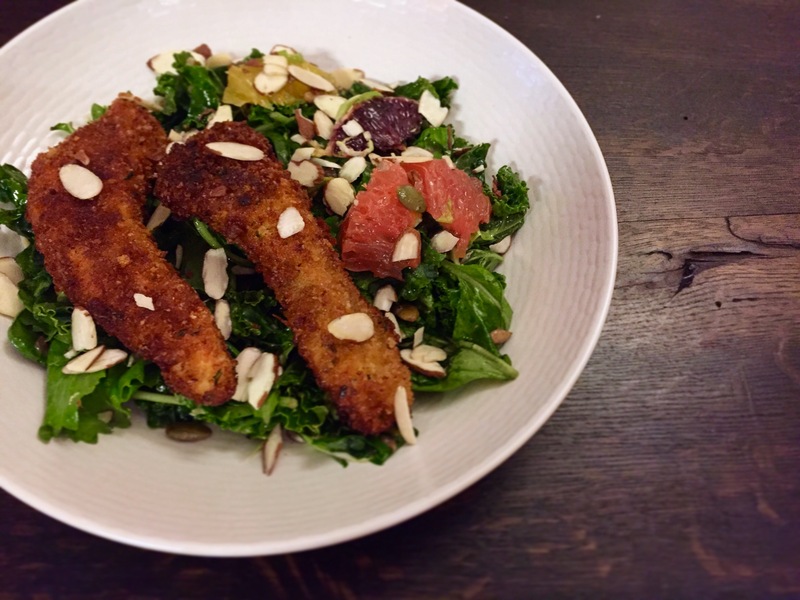 Sweet and Savory: Smoked Almond-Crusted Chicken Tenders and Citrus Kale Salad – Pao Says, "Open Wide!" Its been a while. I know. But I have been working at my new job at Artisan Dental (which I love! Come see me if you’re in the DC/Chevy Chase area! ), and I have truly been cooking up a storm when I am home, with no extra time to document. I’ve been posting pictures of my dishes on my instagram @paosaysopenwide , but haven’t taken the extra time to sit down and actually write the recipes I’ve created. However, this was one I had to make time for. I have been experimenting with a lot of new flavors and combinations recently, and this recipe has by far been one of my favorites. The smoky, salty, spicy, crispy chicken perfectly complimented the sweet, tangy flavor profile of the citrus kale salad. The kale salad is so fresh and light- wouldn’t be half as good if I didn’t get quality ingredients for it, which is why I like to get my produce local. Always amazing stuff from Almaala Farms at Union Market! Rinse and dry your kale. Separate the kale leaves from the stem, rip them into bite-sized pieces, and place them in a large salad bowl. You can massage your kale at this point in order to tenderize the leaves (essentially squeeze it with your hands for like 5-10 minutes… this breaks down the cellulose in the cell walls and makes the leaves softer). Add in the chopped shallot. Section your citrus fruits over a bowl to collect the juices as you go. If you’ve never sectioned citrus before, Mario Batali has a video that explains it pretty well. Check it out here . Place the sectioned grapefruit, blood orange, and orange into the large salad bowl, and grab the reserved juices to make the dressing. For the dressing, whisk together the grapefruit, orange, and blood orange juice with the lemon juice, the salt, and the dijon. Add in the olive oil while whisking the dressing. Add in the basil and whisk it for about a minute to ensure your dressing is emulsified. This dressing is BOMB.COM – just a heads up. Anyways, pour it over your salad, add the sliced almonds, and toss to coat! Combine the flour, salt, and cayenne in a plate. In a bowl, whisk the two eggs with a splash of water. Stick the smoked almonds in a food processor until you have a coarse grind of the almonds (should be no big chunks). Combine this with the panko bread crumbs in a plate. Dredge your chicken- dip in seasoned flour, then in eggs, then in Panko-almond mix, then set aside on a new plate. Heat your oil to med-hi. Once hot, fry up your chicken until golden brown. Serve over the citrus kale salad, or enjoy with sweet and spicy ketchup! Mix together about 1/4 cup ketchup, 1/2 tbsp sriracha, 1/2 tbsp honey, 1/2 tbsp brown sugar. Enjoy! Se ve bien bueno. Estamos locos por que estén con nosotros, experimentando todas esas recetas. Love u!